In an opinion poll carried out in Kyiv last week, 77% of respondents considered the increases in housing and communal services tariffs were unjustified: 45% said they cannot pay the new tariffs, and 44% said they could, but that it would be difficult. Details of a similar poll taken in Donetsk are described in an article entitled, 'To pay or not to pay, this is the question..' in today's 'Donbass' newspaper. In their poll, 40% of those in employment said they would not pay, against 54% who said they would. 47% of pensioners said they would not pay and and equal portion, 47%, said they would. Three quarters of the respondents who are intending not to pay explained that this was because they just don't have the money in their family budget to do this. My bet is that this is a far greater worry for most families that questions about NATO, special status for the Russian language, possible entry into the EU, squabbles in the VR, and so on. Yanukovych declared on Saturday that he is going to turn to the President and Parliament with an initiative to sack Minister of Foreign Affairs, Presidential appointee, Borys Tarasyuk. "What can my attitude be to a minister who states that he is in opposition to the government? This means he does not agree with the program of the government. If you are a man, if you have principles, write a [resignation] declaration, and go. And if not, if you don't want to do this, then of course, we'll help you," said the PM in a TV interview. Yanuk was particularly pi$$ed that Secretary General of the Council of Europe, Terry Davis, did not see him, as planned when he was in Kyiv several days ago. Apparently Davis was 'held up' at a lunch with Tarasyuk. Davis had been particularly critical of the way the first two rounds of the 2004 Presidential elections were conducted and so is well aware of the hanky-panky that went on at that time. A few weeks ago it was reported in the Ukrainian media that during a cabinet meeting, Yanuk broke off when addressing the cabinet, to warn Tarasyuk for 'snickering'. Rumor has it that when Yanuk was last PM, such matters were, on occasion, resolved with fists. I think Tarasyuk is a cool operator who knows exactly what he is doing - for Yushchenko to 'give him up' and accept a PoR candidate for this position would be a big humiliation. But it is also clear that 'playground bully' Yanuk is sick of brainy teacher's pet Borys. Donetsk city council held an unusual and important meeting today during which deputies voted to double housing charges in one stroke. A council commission had proposed a threefold increase, but the mayor of Donetsk, Aleksandr Lukyanchenko, held out for a less punitive increase. During the session deputies could not agree on the increases in tariffs, and the speaker called for a break during which 'Regionaly' held a meeting on their own. Eventually, Lukyanchenko's proposal to 'only' double tariffs was upheld by 50 deputies, 4 voted against, 2 abstained, and 6 did not vote. Out of a total of 81 deputies, only 61 turned up on the day. The city council comprises two fractions - PoR with 68 deputies, and 13 'Vitrenkovtsy'. Motions are normally carried with boring regularity almost unanimously, just as in 'the good old days'. This is the second time this autumn that communal tariffs have been increased. From 1st October bus fares increased by one and a half times in Donetsk, and on the 4th October 'GorElektroTransport' also went up. Heating and hot water charges have almost doubled too. The leader of urban opposition, the chairman of the civic organization "Gromads'ka Rada" Aleksandr Kolchak, made several statements to representatives of the media about the local authority's extortion of the city's inhabitants. "When the local authority is converted from the defenders of people and social partners to prison guards and tax collectors - they becomes a general evil, so it is completely possible that in the very near future, inhabitants themselves will terminate the authority of those whom they elected by mistake in 2006," said Kolchak. Commenting to novosti journalists, the secretary of city council Nikolai Levchenko stated that, "Today any opposition between the council deputies arose around just small dispute, we had a discussion," and when asked about the legality of voting on the motion which took place three times, he claimed 'the reglament' had not been breached. Representatives of the Nataliya Vitrenko bloc severely criticized the decision of their associates, and declared they will refer the matter to the procurator and a court of law in order to cancel today's decision. There had even been rumour that the "vitrenkovtsy" would block the speaker's platform preventing any vote taking place. PoR's website announces to visitors today that 'In three months of work, the Min. of Finance has corrected the negative situation with the execution of the 2006 budget, which occurred during the first half of the current year.. The article is accompanied with this graph - maybe inappropriate in the light of the huge increases in housing and utility charges facing the citizens of most Ukrainian cities ..
"Is a revolution being preparing in Donetsk?" The leader of the Committee of Voters of Donbass [K.I.D. - website here ], Aleksandr Khryakov, told journalists that he considers that, "An Orange Revolution #2," is being prepared in Donetsk. He says he has information that western funds are financing numerous public organizations of a nationalist character, which are now very active in Donbas, adding there are precisely 270 of them. According to Khryakov, this process is proceeding with the support of the Donetsk city council, and also with the support of the city's Head Administration for Community Links, Maxim Rovinskiy. "The nationalistic forces, beginning with the World Forum of Ukrainians, and also from the diaspora, will soon start an investment project to introduce into the economic field of the Ukraine a network of the public organizations, directed primarily for the purpose of "splitting the the electoral field of Donbass," asserts the KID leader. The headquarters of these organizations, in the opinion of Khryakov, are in Brussels, Warsaw, L'viv, Kyiv and Donetsk. These organizations will now conduct a "brutal battle for the power" in Ukraine. He mentions" numerous flows of money, into Donets region, directed toward work with the young people, seminars in forests etc. When 'Donbass' correspondents asked Maxim Rovinskiy to comment on Kryakov's statements, he replied: "This charge would even be flattering to me if it was made by someone other than Kryakov." The Donetsk mayor Aleksandr Luk'yanchenko called these charges fantasies. "Probably, such fantasies came to mind to Mr. Khryakov on the second anniversary of the Orange Revolution," he said. OK, not much of a story, but if but if protests against swingeing increases in housing and utility charges occur, then we know who will be blamed. "Russian capital will pulverise the 'Donetski'"
"Russian capital today has very powerful forces in Ukraine. The Yanukovych government is creating advnatageous conditions for a massive offensive of this capital in Ukraine. Having gained control in Ukraine, Russian capital will destroy both Ukrainian oligarchs, and those who aspire to them. This powerful force will not indulge any opposition. It is very strange that the ruling circles in power are striving as quickly as possible to enter the Single Economic Space. Donetsk capital has certain positions in Ukraine, but Russian capital is already stepping on its heels. Anti-Ukrainians and anti-state forces are activating their actions, taking advantage of their influence in parliament, and exploiting anti-Nato, and pro-Russian attitudes in the government. What surprises me is the short-sightedness of the 'Regiony': if tomorrow Russian capital comes into Ukraine, they'll be pulverised! They don't realise that it is the independence of Ukraine has secured their businesses, and that they should continue on this independent path...Taking into account the substance of Russian capital and its endeavour to become the ruling power in Ukraine, the authorities should give this matter serious thought before giving this capital the 'green light'. This winter Ukrainians are being hit with massive price increases - a doubling and more of their housing-communal-services tariffs and utility charges. I've posted blogs about rumblings of discontent, particularly in the eastern parts of the country previously. Today 'Oglyadach' publishes results of a recent opinion poll in which repondents were questioned on these matters. 72% thought that there was no justification for the increases. and 48.5% thought it was the government that was to blame for the increases. Surprisingly only 14.4% considered that no one was responsible, and that the tariffs had increased because of increase in the price of Russian gas. The author ends his article rather ominously: "So with the first cold spells of November and December we should expect serious mass actions. The experience of Orange revolution shows that the snows of revolution are not an obstacle.."
Today the President's Secretariat issued a detailed statement: "The President's Secretariat calls on the Government and VR to take into account the Head of State's comments on the Projected 2007 Budget," which enumerates the many parts of the budget with which he is not happy. This may well develop into a deeper conflict between the Pres and Gov - the Pres could refuse to sign-off the budget, gaining some 'brownie points' from the electorate. Predominantly in eastern part of the country..
Volodymyr Shcherban, 55, a former governor of Sumy Oblast, was deported from the United States to Ukraine on 4th November. 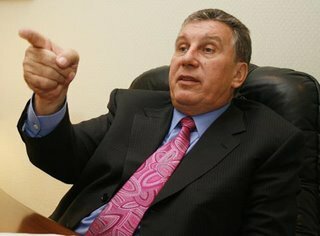 Ukrainian prosecutors had issued an international arrest warrant for Shcherban in 2005, charging him with vote fraud during the 2004 Presidential election, extortion, and abuse of office. Scherban was detained in Florida in October 2005 on charges of being in the United States illegally. He was not taken into custody after returning to Kyiv, but released because several influential deputies from the ruling coalition signed a pledge that he would voluntarily appear for interrogation whenever prosecutors summon him. In 2004 Shcherban gave Sumy students a particularly hard time . Their desperate but dignified appeals, some in rudimentary English, posted on the internet were really quite moving. More on Shcherban's background here. I've translated portions of an hubristic interview [one of several] he gave in today's 'Obozrevatel', entitled: 'Akhmetov put up bail for me.' He makes a few 'Freudian slips'. When asked if he requested Akhmetov to help him out, he replies, "You have to ask him," and claims that had SCM not put up the money, then Industrial Union of Donbas [IUD], owned by Serhiy Taruta, and Vitaly Hayduk who is now secretary of Yushchenko's National Security and Defense Council, would have put up the bail. Wasn't it foolish, to burn your fingers over an overdue visa? "This was usual tourist visa." Shcherban explains that in the USA he was represented by one of the largest companies of attorneys in that country. 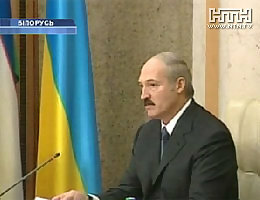 In 2004, Presidential election falsifications in the Sumy oblast, where Shcherban was governor, were maybe even greater that in Donetsk, but Shcherban denies any falsifications took place and suggests that local commissions favourable to Yushchenko, who comes from that part of Ukraine, exaggerated the extent of election fraud. "And your son [Artem - presently a PoR VR deputy] withdrew [from bank accounts] $50 million in just a few days, then transferred them through mediators so that you had something to eat in the USA?" What are your relations with Timoshenko like? "Normal. I have never quarrelled with her. Generally I am a man who dislikes conflicts, but I advise you - don't touch me - I'll eat you, together with your boots." The BBC last night broadcast a current events 'Panorama' program -'Price of gas' . There are some bits on RosUkrEnergo, Firtash et. al. - about 16 minutes into the program and onward. It includes brief interviews with Yuliya T., a decidedly 'shifty' and sweaty Robert Shelter Jones, and old clips of Mogilevich. YULIA TYMOSHENKO: When I was the Prime Minister,. We provided the President of Ukraine with documented proof that some powerful criminal structures, are behind the RosUkrEnergo company. I can only say as a politician: we have no doubts whatsoever that the man named Mogilevich is behind the whole operation called RosUkrEnergo. STEVE BRADSHAW: Simeon Mogilevich is on the FBI's most wanted list - wanted for alleged money-laundering. Seven years ago Panorama made a film about him and asked about his complex business deals- and why he'd opened offshore accounts in Britain's channel islands. Then in April this man - Dimitry Firtash - a Ukranian gas trader - said it's not Mogilevich - it's my company that owns the mystery half of RosUkrEnergo. Attention now focussed on mister Firtash's business associates - including one who did seem - well - unusual. Her name - Louise Lukacs. Gas baron? Mobster? No - out of work Romanian actress with a role in another gas trading company MR Firtash had helped set up. She'd agreed to be on the share register saying she needed help with her phone bill. We asked Mr Firtash for an interview, but were offered instead his British representative. STEVE BRADSHAW:But what on earth was this woman doing with a company in the first place? ROBERT SHETLER-JONES: As is usual in some private businesses, ownership is held on trust for the beneficial owner. It was ... this was one of the trustees who was known to the team that created the company and she was asked, approached, to be a trustee on behalf of Mr Firtash. STEVE BRADSHAW: Figure head for Mr Firtash. STEVE BRADSHAW: Necessarily because... ? ROBERT SHETLER-JONES: Mr Firtash at that time did not want to be a public figure. STEVE BRADSHAW: Was Mr Mogilevich - people wanted to know - perhaps using Mr Firtash as a figurehead? The two men had met and had used the same lawyer. But both deny ever having done business together. Mr Firtash says the hugely lucrative shares he holds in RosUkrEnergo are his own. STEVE BRADSHAW: Are you sure he's not acting on behalf of anybody else? STEVE BRADSHAW: Would you know? ROBERT SHETLER-JONES:Given how close I am to him and his business I would know. I would argue that Rosukrenergo is not a murky company, in fact it is very open and transparent. It is a Swiss registered company. The owners of the company are known, and Ukraine is benefiting today from some of the cheaper gas in Europe as a result of RosUkrenergo's business. STEVE BRADSHAW: Why could Rosukrenergo matter to us? JONATHAN STERN: What happens ... if RosUkrenergo breaks up because there are some problems of governance, or some problems of alleged mafia connections, that could eventually disrupt gas supplies, and that's what we should be concerned about. STEVE BRADSHAW: Gas supplies to? JONATHAN STERN: That could disrupt Russian gas supplies to Europe. That's why we need to be concerned about it. The Ukrainian State Property Fund [SPF] recently postponed for an indeterminate period the tender competition for the sale of 38,14% of the state-owned block of shares in the "Komsomol mine management" company . This was decided by a special VR commission on questions of privatization, which also ruled against additional conditions being applied in the competition. Potential bidders accuse the head of the SPF, Socialist Valentina Semenyuk, of favouring the "Mariupol Metallurgical Combine im. Il'icha", [MMK] which is led by leading Socialist Vladimir Boyko. The head of the VR special investigation commission on questions of privatization, VR BYuT-faction deputy Andriy Kozhemyakin, has referred the matter to the Prosecutor General, the Minister of Internal Affairs, and the security service. Parliamentarians are concerned that the conditions currently being applied considerably narrow the circle of those who can participate in the competition for the purchase of the block of the shares of enterprise, and consider they are biassed in favour the "Mariupol Metallurgical combine im. Il'icha". Kozhemyakin claims that that if the privatization tendering process for "Komsomol mine management" were to be fair, then the state would receive three times more money than is being offered by MMK, as most of Ukraine's FIGs would be interested in bidding and purchasing the shares. "Komsomol mine management" is the sole producer of essential flux limestone for Ukraine's metallurgical enterprises. If the 'Il'ichevtsi' were to regain, via the SPF, the right to purchase the 38% of shares of "Komsomol mine management", practically the entire enterprise would be in their hands, since they already have possession of 60% of the shares, obtained by means of doubtful manipulations. The "Komsomol'sk-Il'ichevsk" conglomerate would become monopolist domestic producers of scarce flux limestone. According to experts, the chances of opponents 'MMK im. Il'ich' purchasing the 38% of shares on offer will only increase if the leadership of SPF is changed, therefore they do not exclude the possibility of a political war between 'Regionaly' and their ruling coalition partners, the Socialists. Experts do not doubt the fact that the MMK boss, "people's capitalist" and leading Socialist Vladimir Boyko, would not fail to exploit his position and take vengeance upon his competitors for all the years of humiliations and offences. Recently the representatives of 'MMK im. Il'icha' accused "Avdeyevskiy KoksoKhimZavod", [coke works] which belongs Rinat Akhmetov, of the intentional disruption of deliveries of coke. Coke reaches other customers on time, but not to us, say the Il'ichevtsy. They have been forced to obtain alternative supplies from the far-off Altai region in Siberia. 'MMK im. Il'ich' has also had problems with iron ore supplies and has had to pay 'through the nose' for their raw material. At a recent conference of the government commission for mining/metallurgy complex, the deputy minister of 'prompolitiki' Pavel Shinkarenko, in premier Victor Yanukovich's presence, warned that the problems being experienced by the industry right now are worse than have been for ten years or more. "Metallurgprom" boss Vasiliy Kharakhulakh stated that during September production of cast iron fell sharply - by 134,000 tons, because of the undersupply of coke to 'MMK im. Il'icha' and "Zaporozhstal', and because of an emergency situation at the 'Yenakievsko Metzavod' . Deliveries of home-produced coking coal to the 'koksokhimzavods' have decreased by 180,000 tons. The association of coke-chemical enterprises "UkrKoks " claims there could be a possible shortage 104,000 tons of coke for metallurgical enterprises during November. Moreover, the Ukrainian KabMin has decided to order 200,000 tons of coal, including coking coal, for supply of power stations, to ensure the country is prepared for winter. There are problems with the import of coal from Russia because of ever-increasing demand from the Chinese. There is also a shortage of suitable railroad wagons for transportation. The problem is so acute that it seems that in 2007 it will be necessary to import more than 10 millions tons of coking coal - an unrealistically high quantity. Experts assert that the present metallurgical crisis is the result of the privatisation campaign of "UkrRudProm", started by Yanukovich government as early as 2004. Then, Ukrainian oligarchs, with the support to President Leonid Kuchma, forced through a law in parliament: "On the characteristics of the privatization of enterprises in the state joint-stock company UkrRudProm ". All the most tasty morsels of the metallurgical pie were divided up between the Financial Industrial Groups's owned by Igor Kolomoyskiy, Vadim Novinskiy, Victor Pinchuk and Rinat Akhmetov. First of all, they determined ownership of the ore-dressing and iron-ore combines, to ensure that raw material supplies to their own industrial enterprises of were guaranteed. Their competitors were left with the crumbs. The 'MMK im. Il'icha' was deprived of deliveries of domestic raw material, and interrelations between metallurgists and miners became almost war-like. Simple workers have also been drawn into oligarchic disputes. [something I have posted blogs about recently] Workers have not only become instruments in the hands of their masters, but also the victims of their business warfare and intrigues. At the beginning of October approximately 150 representatives of the Joint stock company "DonetskKoks" picketed the Donetsk city executive committee. It seems that their enterprise is simply no longer required by its owner - Akhmetov's SCM corporation, which includes more profitable 'koksokhim' works, including the 'Avdeyevskiy KoksoKhim', the largest in Europe. No one has considered the problems of other metallurgical producers and the universal shortage of coke. Protesters holding meetings are carring banners with the inscriptions "Koksokhim workers are not animals! ", "Work for the people - coke for the country", and "Oligarchs - hands off the plant!" Recently the minister of internal affairs Yuriy Lutsenko declared that in 8 months of the present year the state lost 8 billion hryven as a result of the irregularities in the metallurgical industry, that criminal investigations are proceeding into these matters, and that all material has been transferred to the state prosecutor who will make decision on how to proceed. The Minister emphasized that there was no political sub-text to his investigations, and enterprises were being checked independently of the political preferences of their management. [Note: Lutsenko was suspended a few days ago from his ministerial position by the VR. If one considers that the fraction of metallurgy in the export balance of our country exceeds 40%, then the losses to Ukraine may even be greater than the more significant numbers quoted by Lutsenko. "Economy returning to the shadows"
The number of business enterprises in Ukraine who paid their taxes honestly in 2006 has dropped dramatically compared to the previous year. The Institute of economic research and political consultations calculates that Ukrainian companies paid almost 80% of what was due last year, but this year the figure is around 55%. According to the State Tax Administration, Ukrainian financial-industrial groupings [FIGs] are taking advantage of the links between their numermous enterprises to set up fictitious deals and avoid payment of taxes. Meanwhile other companies are complaining that they they are not receiving the VAT repayments to which they are entitled. Newly appointed NSDC secretary Vitaliy Hayduk [see above] has recently been asked by the President to sort out the problem of VAT fiddles - obviously the right man for this vital task. For all of the talk of economic progress and cleaning up of politics in Ukraine, the grim reality is that business, politics and organized crime are intertwined, and disputes are still too often settled by criminal means. Politicians, businessmen, as well as police are still being periodically assassinated. 'Juicy' bits of real estate such as the 'Ozerka' market in Dnipropetrovsk are being fought over by private armies on behalf of their untouchable oligarchic paymasters whilst state law-enforcement agencies stand idly by. Deputies frighten each other with the situation in the country and within their families. Without naming concrete names, Yulia Tymoshenko's bloc has accused the authorities of terrorist attacks against its deputies. A large part of the yesterday's sitting in Parliament was concerned with the drafting of the State budget for 2007. Nevertheless the day began with addresses from several parliamentarians. BYuT deputy Oleksandr Turchinov stated that in Ukraine, "criminal terror has begun [to be used] against the opposition fraction". He spoke at length about several incidents in which representatives of BYuT have been attacked in different regions, in particular about the murder on 27th October of one of one of its leaders in the the Donetsk oblast - a founder of the Debal'tsevsk machine building plant - Gennadiy Bystryakov. Turchynov accused local authorities of indifference in solving the murder. "You had excellent possibilities to demonstrate force and decency of the authorities, when you were the head of the security service," retorted VR speaker Oleksandr Moroz to these charges. Immediately after Turchinov left the podium, up stepped the leader of Socialist fraction Vasyl Tsushko, who stated that, "For the first time I come to the platform not to talk on about politics." Mr. Tsushko reminded deputies, about his recent appearance on an ICTV TV program - "Freedom of Word" when he publicly quoted President Viktor Yushchenko who had once asserted that the company "Unified energy systems of Ukraine" (YeESU), which was headed Yulia Tymoshenko, were responsible for state losses of 8 billion hryven. "After this my family and I were subjected to illegal pressure and persecution from unknown persons," said Mr. Tsushko. He alleged that certain anonymous persons had told him they know the telephone numbers of its family, had provoked a traffic accident, and also intimidated his son and wife. After the VR session Oleksandr Turchynov responded, accusing Tsuskho of talking rubbish, raking over the matter of YeESU for political gain. He suggested Tsushko go to the SBU to provide protection and to check out his accusations. BYuT representatives had stated previously that they were suing Tsushko for slander folowing his remarks on TV, but a spokesman from the judical department, Andriy Portnov, told 'Kommersant' that he knew nothing of this. On 26th October, a BYuT Lviv city council deputy, Roman Fedyshyn survived an assassination attempt during which Fedyshyn's car was blown up - a young schoolgirl, Mariya Kutsynda, was killed. In June two ByuT representatives were killed. On 11th of June Zaporizhzha city council deputy Viktor Savkin was shot dead in Yalta. That same week, Hryhoriy Potelchak, a city councillor from Nizhyn was also killed. BYuT has made many unsubstantiated claims in recent times about murders, bribes of VR deputies, and corruption at the highest levels of government. Nevertheless, people as still being killed with impunity, that's a fact. And while the country has leaders who climbed to the top of the political/business ladder by methods akin to those employed at the 'Ozerka' market, this state of affairs will continue. More on "Ozerka" - UNIAN reports that groups of raiders, many from Russia, have been seen mobilizing in the suburbs of Dnipropetrovsk in order to launch another attack on the market. Unian' s sources speculate that the conflict around "Ozerka" is being used by specific political forces of Russian origin to destabilize the region and then the country as a whole, and that the attempts to take "Ozerka" is a rehearsal for similar actions in other parts of Ukraine. The article mentions that Maxim Kurochkin, one of the two chief protagonists in the tussle, benefits from the patronage of the highest echelons of Russian Ministry of Internal Affairs, as well as that of the Russian president's administration.